Since the blues was being sang by the African slaves through singing in the fields about their pain and their distress you can imagine that this scale does not work at the same way like the major or minor scale do. Instead of seven note that has a connection of tension and release between them the blues scale has Blue Notes which are bended notes that create an impression; a blue impression. What's the meaning of blue? Well a sort of a deep sadness or mellowness. Words can not express the true meaning of the word. Let's see the scale first, then analyse what's going on inside. The most obvious example of this blues notes being wrong is playing a minor third over the first major chord which is quite common to do. There is no logic theoretical explanation for this accepts from the fact that it creates a moody impact. The next note is the fourth note, also a rather active note. In C major scale this note would lead to E but in our case it stands on its own since it functions as a colour note. The next note is the raised fourth (or lowered fifth), F# or Gb in C major. This note is a passing note to the next note G (the fifth note) or F (the fourth note) but could just as well be played on the beat on its own, again to give that blue color. The raised fourth was being added a bit later on to the scale in the face of history and was fully established in the bebop period by Charley Parker and Dizzy Gillespie who used it all the time. The fifth note of the scale is the pure quint and we're lucky to him as a stable note with so many tensed notes next to it. However, if used properly this note could just as intense over some blues chord we're about to learn later. The last note of the scale is the lowered seventh, Bb in C scale. Notice that we don't play the leading tone (which is half a tone under the tonic) but the Bb note, again to supply colour. This note will be the first we're going to add to the triads in order to blues them up! If we look at the whole picture we'll notice that the scale of the blues consists of 6 different notes. They are the 5 notes of the minor pentatonic scale, plus one additional note (the diminished fifth). Click here if you haven't signed to Piano Playground, our free E-zine yet make sure you do that in order to get the username and password codes for the Blues Scales Piano Tab I provide here under. Here's a free piano chord chart of all twelve scales of the blues. The blues can be sung in a minor atmosphere as well. The scale we're going to use to improvise over this minor blues scheme (which I'll show you in a moment is the minor blues scale which we will build in the same we way we did with the major blues. This time the second note of the scale fits with the first minor chord. The mood of the minor scale is determined by the fourth note, the raise fourth (or lowered fifth) and the seventh note. When combining both the minor blues and major blues scales we will hear the interesting contrast between the major and the minor impact of the scale since A minor blues has both Eb and E.
The sixth degree will be added as well and add a different sort of color. Bottom line, an extended scale containing both the major and minor blues scales could look like this. At first the blues was being sang freely but later a standard was settled and the the 12 bar blues was being created. There are few reasons to learn to play piano scales. Scales will help you to understand the logic behind a piece you play, and give you tools to build piano chords and harmonize tunes by ear, and if you want to improvise you should use scales to play a solo to really impress your friends and fellow musicians. 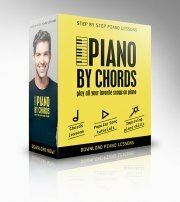 In order to get the full potential of piano scales you should go through the Rocket Piano Ultimate Learning kit. With Rocket Piano you'll learn to use scales to improvise by learning about melody, harmony, chords, arpeggios, and how to play chord progressions in any key.